My esteemed colleague and friend, Dr. James Piecowye, interviewed me some time ago for his podcast, Nightline, and when we discussed my horror novel, The Skinwalker: Resurrection, he asked me why I keep trying new genres. I told him that I simply love trying new things and accepting the challenge that this brings to my writing abilities. I, like many people, get bored doing the same thing over and over, and as a Gemini, I’m no fan of routine or rules. Who said that a children’s writer must be only that until the end of time? Where is it written in stone that as authors, we can’t try what pleases us? Actors do it all the time. How many actors can you think of that have tried different types of movies? Jim Carrey was known as only a comedic actor until he starred in The Truman Show, for example. Writers should also strive to experiment. Besides, one of my favorite things about writing a horror was the fact that I got into the mind of a monster. I had written a villain before, the Blue Jinni, but this was the first time I could be absolutely RAW, and as painfully horrific as I wanted. The Blue Jinni is a great monster, one you love to hate! He thought of himself as a good guy, in fact, ridding the world of the pest called “human”, but Haseeya knew that she had fully embraced the “witchery” way, full on darkness. That was interesting and liberating to write. Dr. Piecowye and I also talked about why it was more fun for me to write such dark characters, and I replied that I guess it’s because as our bad guys, we can say things that we normally don’t get to say in life. There’s a freedom in that. Plus, as actors love playing their opposites, I think writers love to write their opposites as well. Yes, in real life, I’m a pretty nice person, but on paper, I rather enjoyed the chance to release the dark side of my nature. I’ll be coming back to horror at some point. I absolutely know this to be true. Haseeya isn’t my only dark monster, but before I come back to horror writing, I’ll have to soon clear the decks to write a prequel to The Hakima’s Tale. 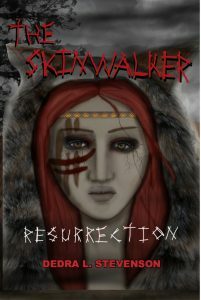 It’s time for the world to know Iretunar: The Blue FIre of the Desert, but in the meantime, you may want to pick up a copy of The Skinwalker: Resurrection (if you dare, and if you’re over 15 years old). Read it one dark night, when you’re all alone. I guarantee that the shivers will run up your spine! Enjoy my horror novel! Parental discretion is advised.